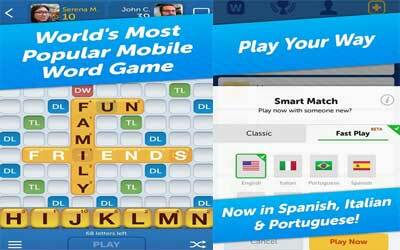 If you love to play word game, Words With Friends APK 3.806 could be one of the best options for you. This game allows you to challenge another random player or your friends. You are allowed to challenge anonymous opponent as well. It also challenges you to create words. The game which can be played offline and online allow you to earn more points to get the ultimate win. To win it, you need to combine letter to make word. In addition, to play Words with Friends, you will be required to register by creating your username. Even though this game has the limitation in which it cannot be played by single player, you can enjoy Words with Friends game with multiple players. It may be a bit difficult for those who are unfamiliar with word games. Some players may need time a little longer when doing a match if they do not get used with this kind of game. You can enjoy this not only on Android mobile phone, but also on tablet and computer as well. To enjoy Words with Friends in Android mobile phone, it requires the minimum operating system of Android 4.0. The game of Words with Friends provides many features. It allows you to improve the English vocabulary through the word of day feature and from dictionary. You are not only allowed to have a match with friend, but you also can chat with them. In English with fast play mode, you can challenge another player to play and think faster. The performance and improvement you have been made can be tracked which is available with the detailed status. You can compare the score that have been earned with other players. Grab this game fast because Words with Friends for Android is quite fun to play. We’re back with an update that has made your favorite game even better! The Play Someone New feature is the perfect way to find new opponents waiting to challenge you. In this version, improvements have been made so that you are now able to see who’s currently online and discover more of your friends and mutual friends than ever before!